This school of business provides inimitable opportunity to learn at very advance, to cope up with the challenging, driving and pleasing atmosphere to improve skills and ideas capable to last throughout the life time. All the others motive in this institute is too deliver excellent education and progressively develop skills of the students. This school shape students into highly talented professionals having innovative business skills, and building their behavior and skills in decision making. Schools has several functional areas in business, it not only develops students’ skills but also to develop their leadership quality in present organizations. They train students to be in pace with the developing management world and to mold students into better human being personally and professionally. They offer constant classroom learning and practical experience on value-based culture which helps their students to overcome any problems in this present situation. This school’s curriculum also improves student’s communication, time management, teamwork and critical thinking skills along with technical and theorical knowledge. They also drive students toward active learning and keeps them aware with the recent technologies. This institute provides fair opportunity in placement for students and they have a separate placement and training cell . They also guide students for internships and also jobs for students and they also organize workshops, industrial visit etc. Recruiters of this college is Genpact, ICICI bank, café coffee day, Cipla, Pepsi, Big bazaar and many more. 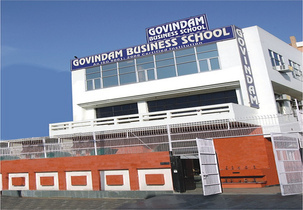 Are you Interested inGovindam Business School Executive MBA"? Please provide the following details.